At AHS, our mission is to provide a patient-focused, quality health system that is accessible and sustainable for all Albertans. Research demonstrates that people who identify as a sexual or gender minority have many unmet health needs and have a reduced likelihood of accessing routine, emergency and preventive healthcare services. This happens when people feel afraid to come to healthcare because of discrimination (real or perceived). AHS strives to create an environment that highly values diversity and welcomes and respects people’s contributions. An environment where everyone, including patients, families, healthcare providers, physicians and volunteers feel safe, healthy and valued. Creating safer and more welcoming healthcare increases the quality of care and experience we offer to everyone. We provide this safer environment by ensuring that how we work together with patients, clients, families and each other is guided by our core values – compassion, accountability, respect, excellence and safety. To learn more, visit the AHS Code of Conduct web page. AHS’ Patient First Strategy works to promote respect, enhance communications, support a team-based approach to care and improve transitions in care. This inclusive approach focuses on the individual needs of every patient. To support you with finding a doctor, visit AHS Find a Doctor. If you have concerns about your care, contact AHS Patient Concerns & Feedback. For more information email diversityandinclusion@ahs.ca or call Health Link at 811 or 1-866-408-5465. Alberta Health Services is an inclusive organization that recognizes that everyone is different and valued. 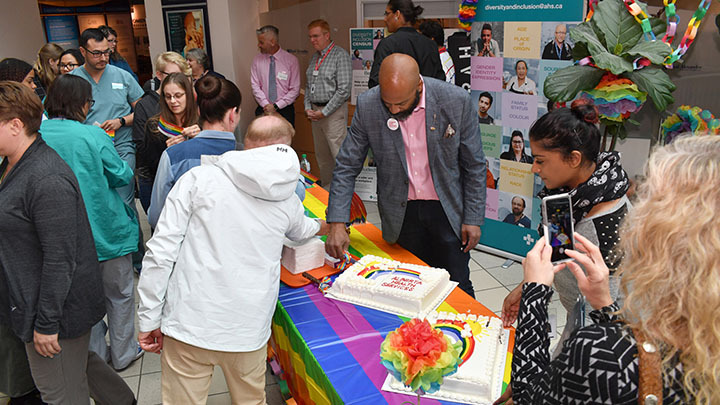 AHS attends a number of events throughout the province to reach out marginalized groups who may have poor experiences in the past with their health care - Pride is one of those events. 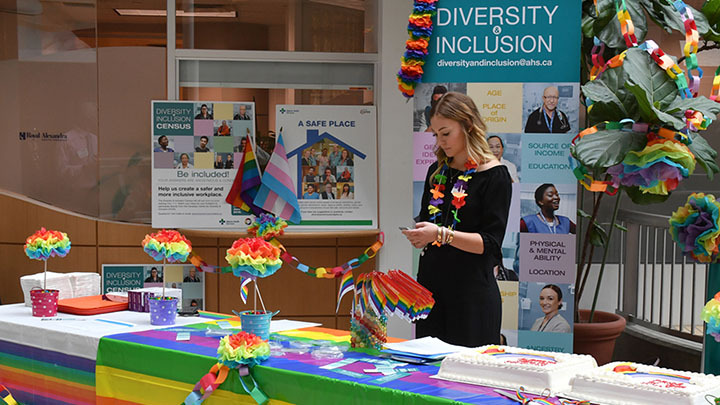 The AHS Diversity team came to Royal Alexandra Hospital to celebrate Pride. AHS provides care and services to approximately 500,000 Albertans who identify as part of the sexual and gender minority population. Reference: The Jasmin Roy Foundation (August, 2017). The values, needs and realities of LGBT people in Canada in 2017. 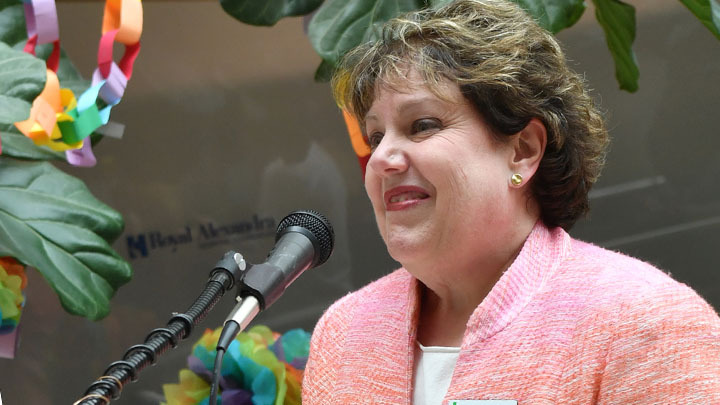 Deb Gordon, Vice President & Chief Health Operations Officer Northern Alberta, spoke to people gathered at the AHS Pride celebration at the Royal Alexandra Hospital. 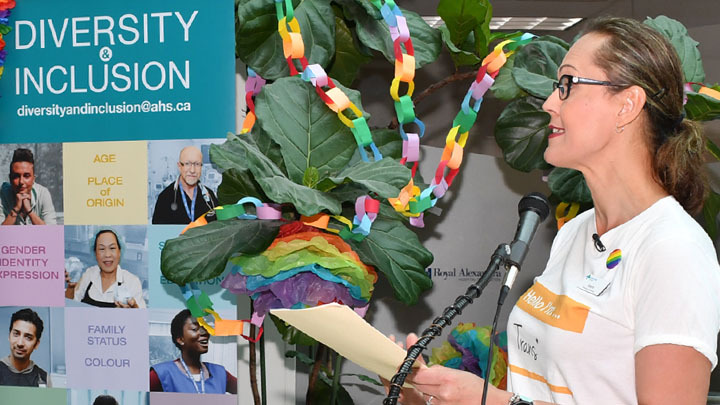 Marni Panas, Interim Lead Diversity and Inclusion at Alberta Health Services, was emcee for the AHS Pride celebration at the Royal Alexandra Hospital. 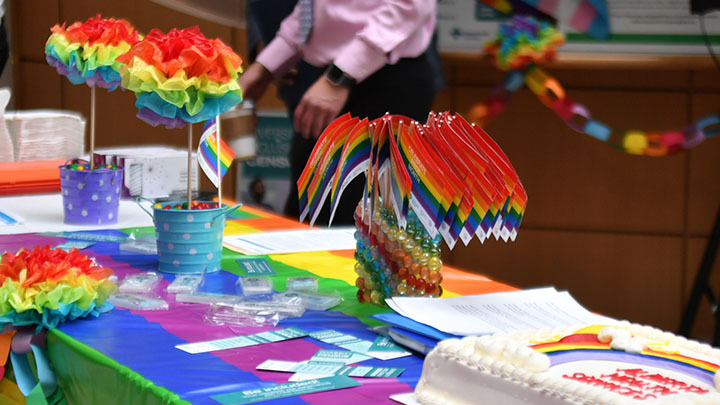 Staff and community members were welcome to participate in education sessions – some things people could discuss with presenters were creating inclusive spaces for sexual and gender minority people and using inclusive language. Sarah Hope, Senior Advisor with Community Engagement and lead for the Provincial LGBTQ2S+ Advisory Council, happy to talk about diversity at the Royal Alexander Hospital. Cake made for the AHS Pride celebration at the Royal Alexandra Hospital.